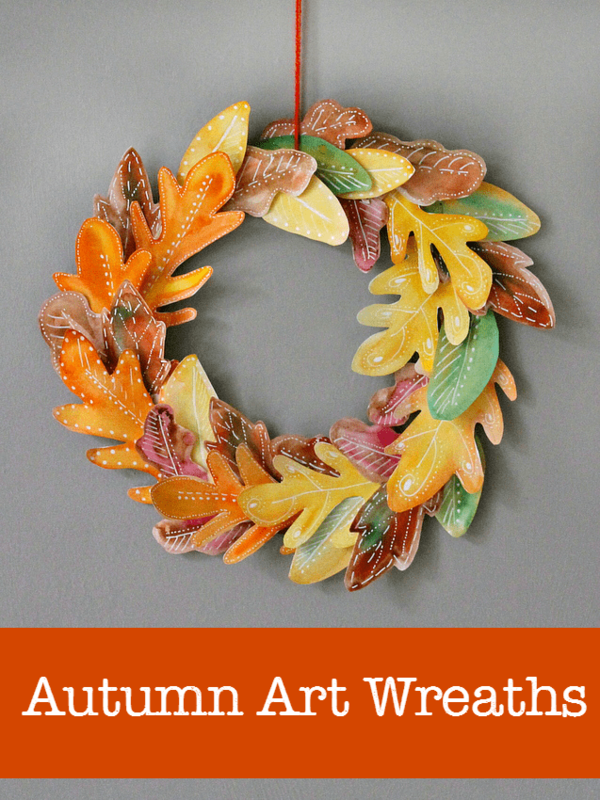 Ten simple ideas for beautiful homemade fall wreath projects, using a variety of gorgeous art techniques, suitable for kids of all ages. It’s the autumn equinox this week marking the official start of the autumn season. What better excuse to make some gorgeous art to decorate your home. We make a different wreath for our front door each season, and for this turn of the year we’ve made one from a favourite art technique: using watercolour paints and white pen. Here’s how we made ours, with some extra ideas at the end for different wreath crafts you can make with your kids, using a variety of techniques, to suit all ages. Watercolours are my most often go-to material as I just love how the paints blend together. 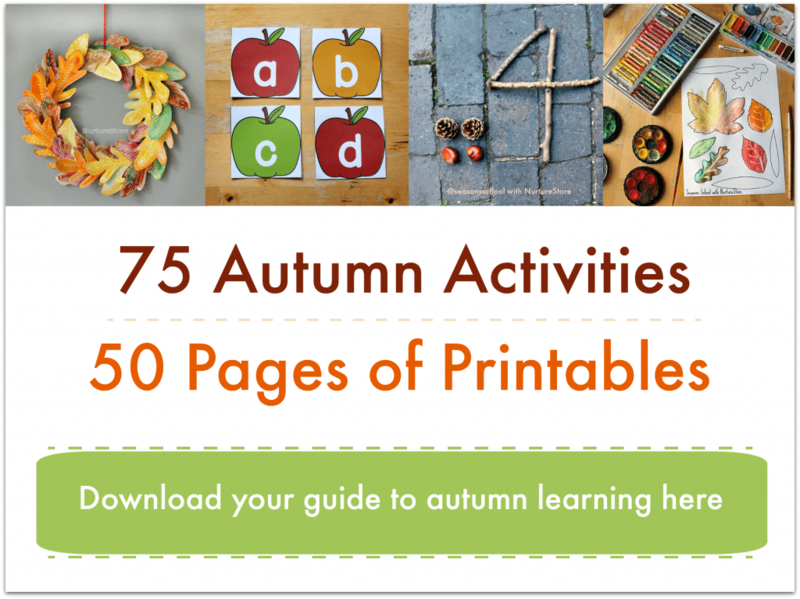 (You might have seen the leaf alphabet we made with them.) 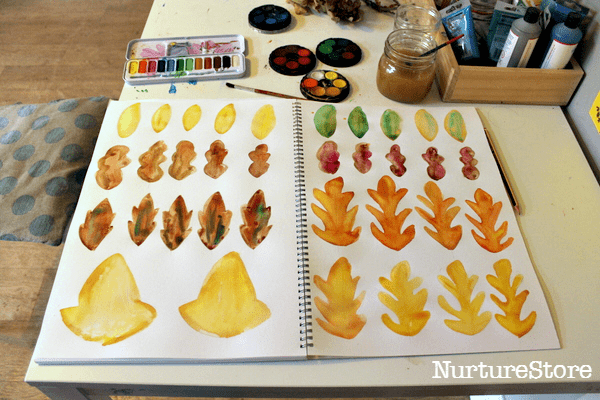 We used them today to paint out a variety of leaf shapes, in autumn colours. Applying a second watercolour onto a still wet area of paint will allow the two colours to seep and blend together, creating the effect I like so much. 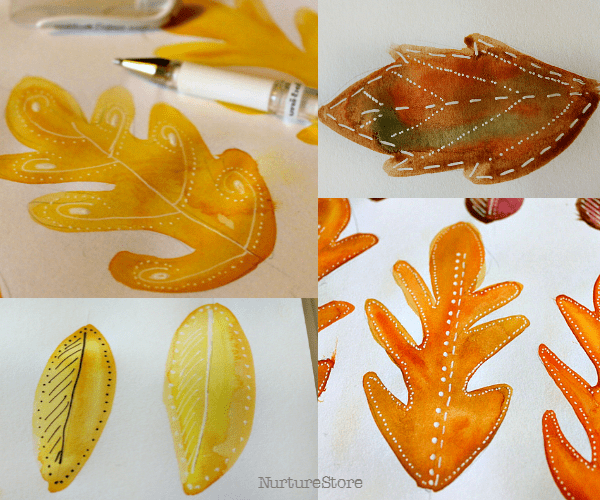 Once dry, you can add extra detail on top of the leaves using a black or white pen – whichever you like the look of best. We use Uni-ball Signo pens. You can add spots, stripes, swirls, anything goes. I really like how it makes the leaves look as if they have been stitched. Then you’ll need a circular frame for your wreath. 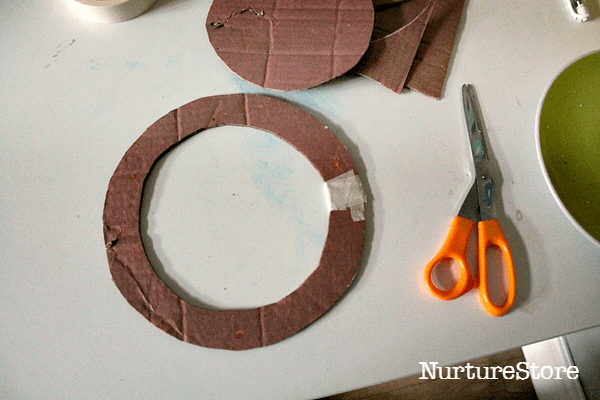 A paper plate is perfect, but if you plan to hang your wreath outside on your front door you might prefer to use some thicker card, such as the recycled packaging board we used. 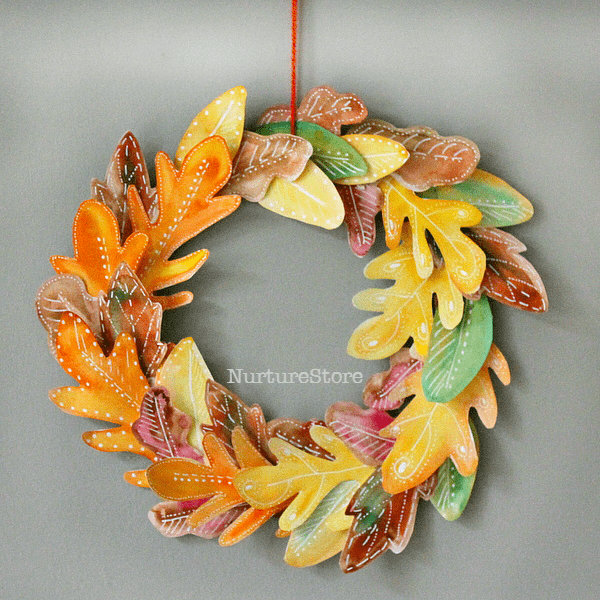 Cut out your leaves, decide how you want to arrange them around your wreath, and staple them in place. You can overlap the leaves so that the staples are hidden underneath and can’t be seen. I’m so pleased with our wreath – it’s so pretty! We are most often all about the process of making art, but it is nice to make something that makes you smile every time you see it. I like how it looks lovely from the street, but then the extra detail of the white patterning is visible only when someone comes up to the front door. My friends around the web have some more gorgeous wreath ideas for kids to try. Happy Hooligans has a lovely tissue paper wreath. Toddler Approved has a great pick-and-mix wreath making station. 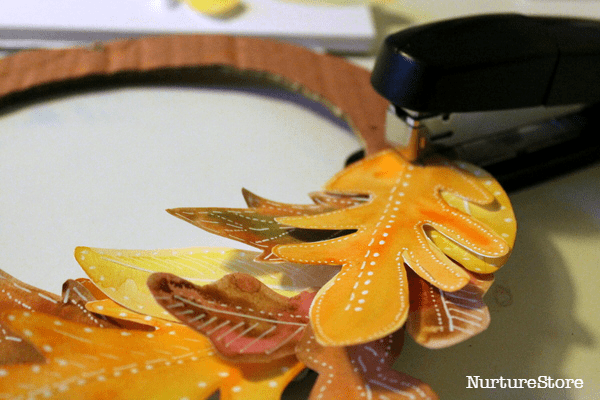 Buggy and Buddy uses tear art to make their fall wreath. Mama Pea Pod has an autumn wreath with real leaves. Mess for Less had a gorgeous handprint wreath. I love how Meaningful Mama has included the whole family in her wreath with paper leaves. 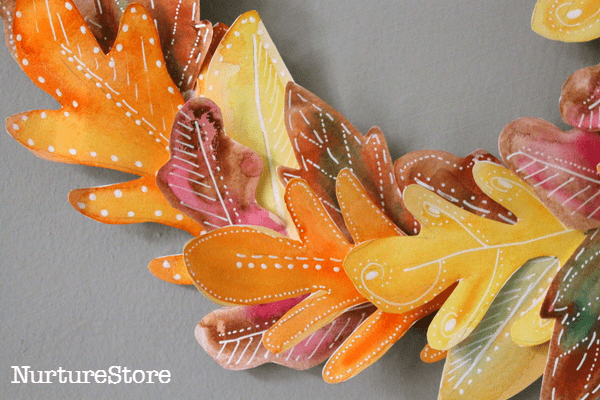 This wreath I made for Kids Activities Blog uses beautiful leaf prints. Fun At Home With Kids made a wreath with natural materials. And this apple print wreath at No Time For Flash Cards is so pretty.